As I’ve already mentioned yesterday, the much anticipated patch 1.1.0 for the game StarCraft II: Wings of Liberty has been released yesterday in USA and today in Europe, although there were some delays on the Battle.net maintenance. So now the game has official stereoscopic 3D support for Nvidia’s 3D Vision active shutter glasses among a lot of other improvements and fixes also introduced in the update. One of the first things you’ll probably notice after patching the game is the stereoscopic 3D panel available in the game options for control over the depth level and convergence level. A Nice addition, but unfortunately not doing so well with the 3D Vision IR transmitter’s hardware controls… the in-game settings override the functions of the IR transmitter and keyboard shortcuts and you cannot enable/disable the 3D mode from it or control the depth level, so you need to use the 3D options panel only! Most of the small details that were previously in 2D like the mouse cursor and units’ health bars are now rendered in 3D mode. And although still some objects in the HUD remain rendered in 2D like text balloons over units and some of the in-game objects for example and these rendered in 2D over a 3D environment with higher depth may not look very comfortable. The good news is that there are just a few minor things left, so it is not such a bother. As already mentioned the mouse cursor is rendered in 3D changing its depth to match the level of depth of the objects you place it over, however for deeper holes or structures reaching high it is not yet working perfect, although it is still Ok.
What came as a bit of disappointment is the removal of the stereo 3D rendering of the cutscenes which are not pre-rendered movies, so they remain in flat 2D although they are consisted of 3D objects rendered in real time. The reason for that decision is probably due to the dynamically adjusting the level of depth/convergence in these scenes, because they do not match the normal settings that work for the game and thus Blizzard has probably decided to leave them out of the S3D for now (the stereo 3D mode gets forced to off by the game in the cutscenes). 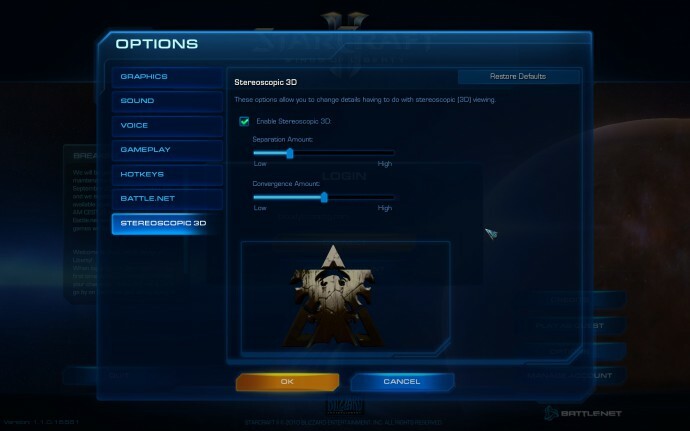 The default levels of depth and convergence that are set in the StarCraft II patch 1.1.0 may seem a bit extreme for most users new to stereo 3D, so you might want ot lower the sliders a bit, but more experienced 3D users should be Ok with that and will probably be happy to even increase the depth levels a bit. So the Patch 1.1.0 is definitely a good improvement for StarCraft II including the stereoscopic 3D support, however there is still some work to be done in the next patch for the game in order to make everything work not just Ok, but perfectly well in stereo 3D mode. So maybe in Patch 1.2.0 for the game we might even see the game receiving 3D Vision ready status after Blizzard makes it even better working in stereo 3D mode. Another interesting update today is the official release of the StarCraft II Patch 1.1.0 that was supposed to make the game perform great in stereoscopic 3D mode by using Nvidia’s 3D Vision technology. Well the patch is now already available in USA with the European release expected in a few hours, unfortunately because of that fact I’m still not able to try it, so everyone from the States is welcome to report on the improvements in the stereo 3D support in the new patch. 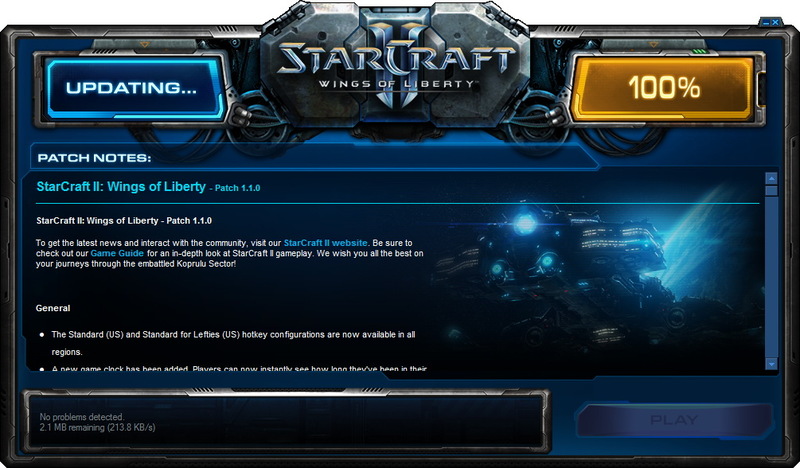 Of course aside from the official 3D Vision support the 1.1.0 patch for StarCraft II: Wings of Liberty brings a lot of other improvements and fixes, along with balance improvements of course.